Woo-hoo! Today is my birthday! :) And I am celebrating on the blog today by hosting this amazing A Little Birthday Pampering Giveaway! 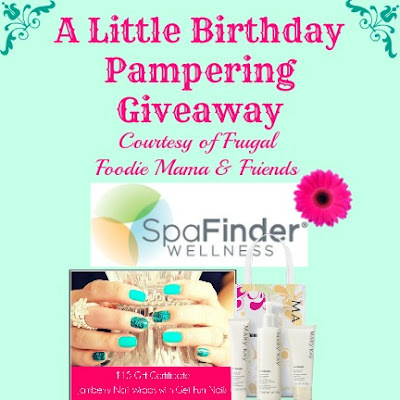 Who wouldn't want a little pampering on their birthday? Or someone else's birthday? Or any day, really? That is right, my friends! $100 to spend any way you choose at SpaFinder.com! Have a pedicure, maybe a massage, get a new spiffy hair cut, or maybe choose to take a few yoga or meditation classes with it instead. SpaFinder gift certificates are accepted at over 20,000 spas, yoga, pilates, and fitness studios worldwide! (Please note- this giveaway is open to U.S. residents only though!) Be sure to click on over to SpaFinder & check that there is a location near you that accepts the gift certificate before entering! And in addition to your $100 in your choice of pampering, you will also get $15 to spend at my friend Susan's online Jamberry shop. If you haven't heard of or had a chance to try Jamberry nail shields yet, you are missing out! I LOVE to use them on my toes especially- no drying time (perfect when you are juggling a toddler & trying to do your nails ;) ) & they last from 4-6 weeks on your toenails! Ready to get entered to win?? Make sure you read ALL the giveaway terms & conditions below. I am stickler for them, and not following them can and will get your entries disqualified! *This giveaway is open to U.S. residents. All entries for the winner will be checked and verified, so please make sure you are doing what you are claiming in the Rafflecopter or all your entries will be voided. No funny business, folks. ;). By entering you give the right to use your name and likeness. Number of entries received determines the odds of winning. One winner will be selected. The winner will be notified via the email they provide, and will have 48 hours to reply to the email. If the winner does not reply back within the 48 hours, they forfeit the prize and a new winner will be chosen via Rafflecopter. This is a giveaway sponsored as a group buy, which means the bloggers pooled their money together to purchase the SpaFinder gift certificate for you. SpaFinder, Jamberry, and Mary Kay are not sponsors of this giveaway. The SpaFinder gift card will be sent via email directly from Carrie of Frugal Foodie Mama. The Jamberry gift certificate and the Mary Kay Satin Hands Set will be sent separately and directly from the respective representatives/consultants participating in this giveaway. Frugal Foodie Mama is not responsible for the delivery of the Jamberry gift certificate or the Mary Kay Satin Hands Set. Entries must come from your MAIN social media accounts, not accounts that have been set up separately just for entering giveaways. Entries from these types of accounts will be disqualified. Protected tweets do not count as an entry method for tweeting. Tweets must come from a public account. Bloggers in this group giveaway and their immediate family members in their household cannot enter or win the giveaway. No purchase necessary. Void where prohibited by law.